Today’s collegiate look comes mostly by the way of the Marketplace.I found the Jonathon Outfit by [[>CaKe!<]] for just $1L. Wearing the University Jacket and Sneakers, I was not happy with the system jeans that were included, I stopped by Free Dove and grabbed the FREE JZ- Men’s Classic Blue Jeans by Dolome Designs. Accessorizing this look, I picked up the dollarbie Big Headphones also by [[>CaKe! !<]] on the Marketplace. Anyone know where a kegger is happening? 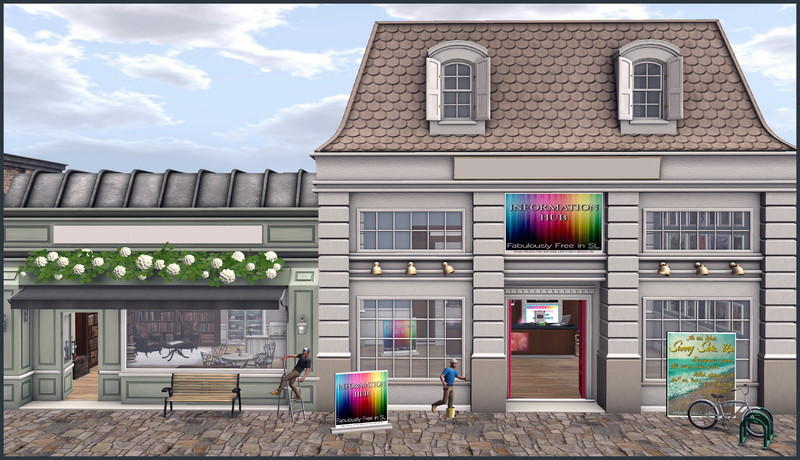 Categories: accessories, appliers, dollarbie (1L-3L), eyes, Free, hair, just for guys, Marketplace, mens, mesh, Mesh Heads, outerwear, pants, shoes, Uncategorized | Tags: 0L, ADAM, Carson Caiben, Catwa, Dolome Designs, fab free, fabfree, fabulously free in SL, fashion, free, Free Dove, free fashion sl, free in sl, free sl, freebie, freebies, freebies sl, gift, gifts, GlamRus, Ikon, just for guys, Labyrinth, mens, Mens Where?, Nivaro, No Match, Second Life, sl, Tips for New Residents, Uncategorized, [[.CaKe!.]] | Permalink. Spring has sprung at Feeb’s Rascal Street! 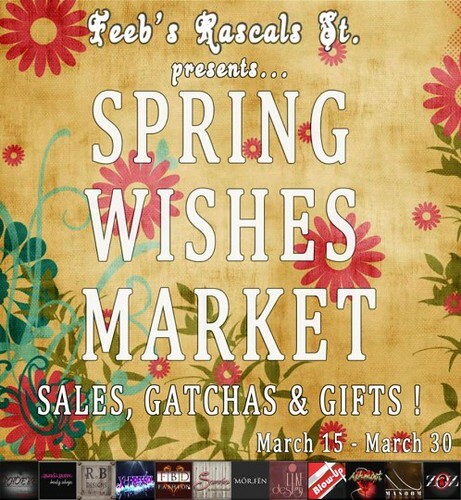 From March 15th – March 30th you can get your Spring on at The Feeb’s Rascals St. Spring Wishes Market. There are tons of amazing designers participating and on their carts you will find exclusive items and most carts also contain either a free gift or a “cheapy” priced under 10L. You have just a couple days left to take in this great event! Below you will see me displaying a selection of the sweet things you can find at this event, but don’t think this is all.. because the streets are packed with carts! 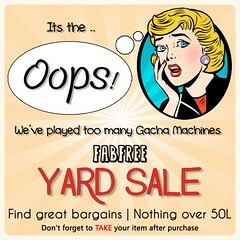 Categories: accessories, dress, events, gacha, hair, Home & Garden, jewelry, mesh, other, pants, poses, shirt, shoes, skins, skirt | Tags: Arcade, Clawtooth, Dryer Maker, event SL, fab free, fabfree, fabulously free in SL, Feeb's Rascals St., gacha, glitzz, Ikon, Juxtapose, Love Trill, Masoom, ns cutie store, Panda Punx, Pomposity, RD Style, sale SL, Second Life, sl, Slink Exposeur, Spring Wishes Market, TRUTH, Wizardhat Studios, [[.CaKe!.]] | Permalink. Hiya Fabbies! You aren’t going to believe this… but Truth Hawks is WOWing us again! I am still trying to financially recover from his recent hair sale where there was hair as low as 35L lol. I think I must have made 10 trips during the sale, and it’s not like I didn’t have a ton of them already lol. I am an addict! You can’t laugh at me – I saw a lot of YOU there too, you know who you are! Some of you were inside the store running around like that WB cartoon Tasmanian Devil clicking and buying and passing out from the excitement. I watched it all from the outside, with “the others” lol, who tried to climb the sim wall from the Truth District, desperately camming in for purchases, cursing that we didn’t just have 3 more feet of draw distance so we could reach that hair way way in the back. The sale is now over, but he has now released several brand new dishy mesh styles (at this temporary location and on marketplace) with new pack options and colours. This is big news to a bona fide hair whore and die hard Truth Hawks fangirl like myself (blush), but the big news doesn’t stop there! You could win a $L2500 Truth Gift Card and have your picture featured in the store! 10 lucky winners will also be selected initially and when it’s time to rotate the posters, Truth says he will continue to select pictures from the pool and they will receive a $1000 Truth GC! Competition opens 14 May 2013 SLT and closes 1 June 2013. 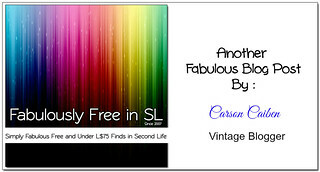 Categories: Contests / Raffles, hair, quickies | Tags: *FTL*, aDORKable, contest, Essences, fab free, fabfree, fabulously free in SL, Ikon, L&B, Love Trill, MOCK Cosmetics, new release, Second Life, sl, TRUTH, Truth Hawks, Truth Model Search, [[.CaKe!.]] | Permalink. Sophia Has Her Cake & Wears It Too. Good news Fabulouses! CaKe has placed out a brand new group gift for their inworld group members and it just happens to be one of my favourite designs in their whole store. I actually already have this adorable mesh Zigzag Dress as it has been featured at Acid Lily and at their mainstore, but you can now pick it up for free after you join the free inworld CaKe group! Categories: dress, Marketplace, mesh, poses | Tags: *FTL*, 0L, fab free, fabfree, fabulously free in SL, FaySe, free in sl, freebie, group gift, Ikon, Love Trill, Marketplace, MESH, pxl, PXL creations, Second Life, sl, SL Freebies, SLink, The Boutique, TRUTH, [[.CaKe!.]] | Permalink. I can’t wait for summer days with short shorts and breezy blouses. It has been a long RL winter, but it doesn’t have to be in SL. In fact… it’s whatever season you want it to be here, so summer it is for me today! The mesh floral blouse, called Meadow Spring Top, available in both brown and green is the March group gift at Mirror’s Enigma. 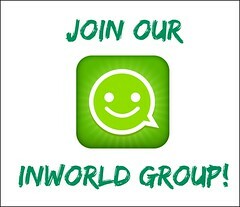 In order to join the inworld group, you must make a purchase within the store and then you are sent an auto invite. Of course you will need the perfect denim shorts to go with this great top, so head on over to Acid Lily and pick up the CaKe Denim Floral Shorts that they have featured this week for just 70L. Sweet Leonard always hooks me up with cute and unique accessories, and today was no exception! The inworld group is 70L to join, and after you are a member you gain access to a wall of gifts such as the Squirrel Coffee and the Cross & Hearts Ring shown in the photo. The Sunberry Travel Bag I am toting around is stuffed with important essentials like a magazine and some cash. This can be found on marketplace for free in both beige and grey. Categories: accessories, groups, jewelry, Marketplace, mesh, other, pants, poses, shirt | Tags: *FTL*, Acid Lily, fab free, fabfree, fabulously free in SL, free, free gift, free sl, freebie, group gift, Ikon, Love Trill, Marketplace, MESH, Mirrors Enigma, Needful Things, Ploom, sbco, Second Life, sl, Sweet Leonard, Y&R, [[.CaKe!.]] | Permalink. 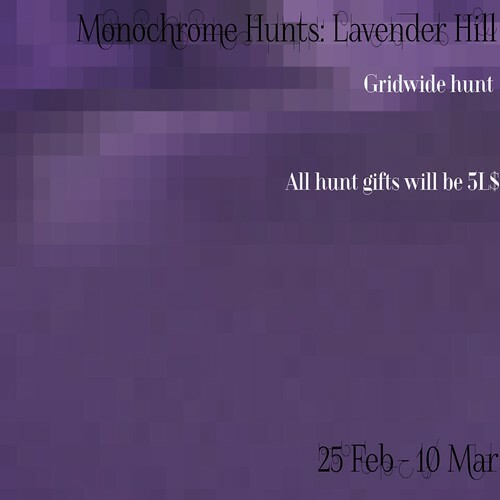 OoOoOoO This is a fantastic hunt that just makes me feel SO SPRINGY with all of the gorgeous gifts being themed in a sweet shade of lavender 🙂 The Lavender Hill Hunt is put on by Monochrome Hunts and runs from February 25th – March 10th. Each prize is 5L and the icon you are looking for is a lavender coloured swatch. There are approximately 20 stores participating in this hunt – so you’ll be done in a jiffy! You can find a complete participating shop listing with hints, an example of the hunt icon as well as a prize preview. Below you will see me lounging in the plush Marguerite Armchair in Moonlit Lavender that can be found at Senzafine. It has 10 single animations and has a LI of 15. The eclectic wall art collection behind me is the gift you will find at *Ionic* and has a land impact of 8. My stunning lavender mesh maxi dress (*SQUEALS*) is the hunt prize at Intrepid. At Pure Poison, you can find these cute little mesh lavender earrings, and the makeup tattoo is courtesy of Adore & Abhor. The make up set from A&A includes two eyeshadows and a lipstick tattoo, however I am just wearing one of the eyeshadow tattoos. These adorable bunny chairs are hidden in the LHH icon at Breno and contain a few sitting poses, with a couple of accessories like a book, or a kindle. They are copy so you can rez as many as you like. These striped pastel mesh beauties in Wildflowers and Sea Foam are the Fae Sweaters you will find at Leri Miles Designs. My Purple Deco Necklace is from SIGMA Jewels. NuDoLu has two prizes hidden at their store! Inside one you will find the Voyage: Pendentif de Matriochka which is the necklace I am wearing, and the other prize is the Robe en Maille Style Vintage Dress which is mesh. [CIRCA] also has two hunt gifts. In one icon you will find the Lavender Hill Sit Pouffe (with animated sit menu) and Short Shadow Box Table. In the second icon you will find the taller Shadow Box Table. It’s hard to see from the photos, but the shadow box tables have a super cute garden inside them with a glass table top for viewing. The elegantly textured mesh Cami Lavander Dress can be found at Immerse. 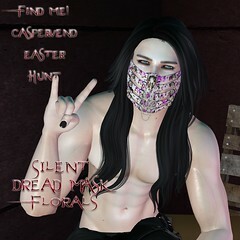 Even.flow is participating in the Lavender Hill Hunt and their prize is the mesh Muffin – Sleeved Shirt in Lavender. I paired it up with a fantastic pair of mesh skinny cuffed jeans made by CaKe that is currently being featured at Acid Lily this week for just 70L. Categories: accessories, dress, formalwear, hunts, jewelry, makeup, mesh, other, pants, shirt | Tags: *FTL*, *ionic*, 5L, 5L hunt, Acid Lily, Adore & Abhor, Al Vulo, Breno, Duh!, Even.flow, Exposeur, fab free, fabfree, fabulously free in SL, hunt SL, Ikon, Immerse, Intrepid, Lavender Hill Hunt, Leri Miles Design, LMD, Love Trill, Monochrome Hunts, NuDoLu, Pure Poison, Second Life, Senzafine, SIGMA Designs, sl, SLink, TRUTH, [CIRCA], [[.CaKe!.]] | Permalink. Someone super important a really long time ago said “Let them eat cake”, and while we can’t really eat cake here in SL, we can wear it! This month in fact, you can wear it for free if you join the free inworld VIP group. The [[.CaKe!.]] Group Gift for January is packed full of some great clothing staples such as the green sweater, jeans, heels and belt shown above. Inside the pack is also the skirt shown below. I have accessorized my outfit with some dollarbie jewelry I found in the *TWISHEE* marketplace store! The Agam Set includes the prim nails, ring in both left and right options as well as a matching L&R bracelet (not shown, but looks like the ring, only bigger!). My Necklace and Earring are called The Mudra Set. Both of these sets are 1L in the *TWISHEE* Marketplace store along with a ton of others!! If you are a member of the Mirror’s Enigma inworld group, you can go on down and pick up the latest group gift. This month Ydreece is offering her Leigh Skin in both Smoky and Natural in the Native Skintone with cleavage/no cleavage option and appliers. 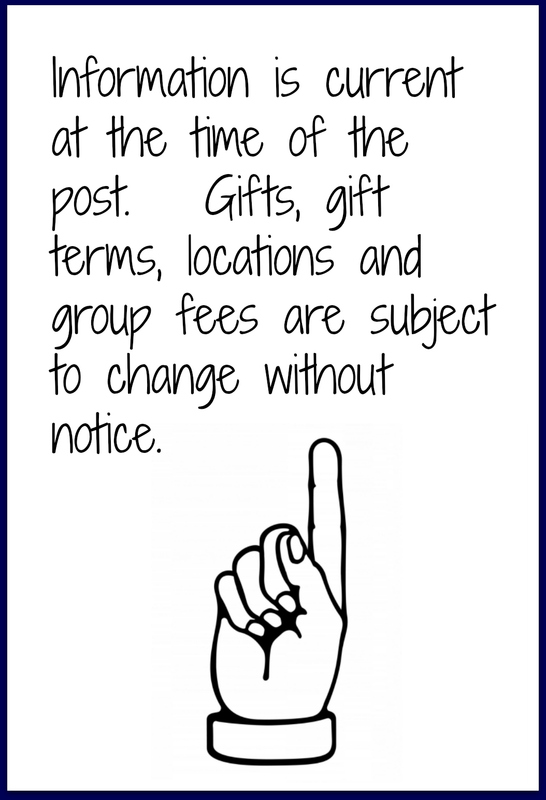 If you are not a member of the group and would like this gift, simply make a purchase in store and you will be auto invited to the group. OoOo Friday tomorrow – FINALLY! Categories: groups, jewelry, Marketplace, other, pants, Piercings, shirt, shoes, skins, skirt | Tags: *TWISHEE*, /ME, dollarbie, fab free, fabfree, fabulously free in SL, free sl, group gift, Ikon, Love Trill, Marketplace, Mirrors Enigma, Ploom, Second Life, sl, [[.CaKe!.]] | Permalink.